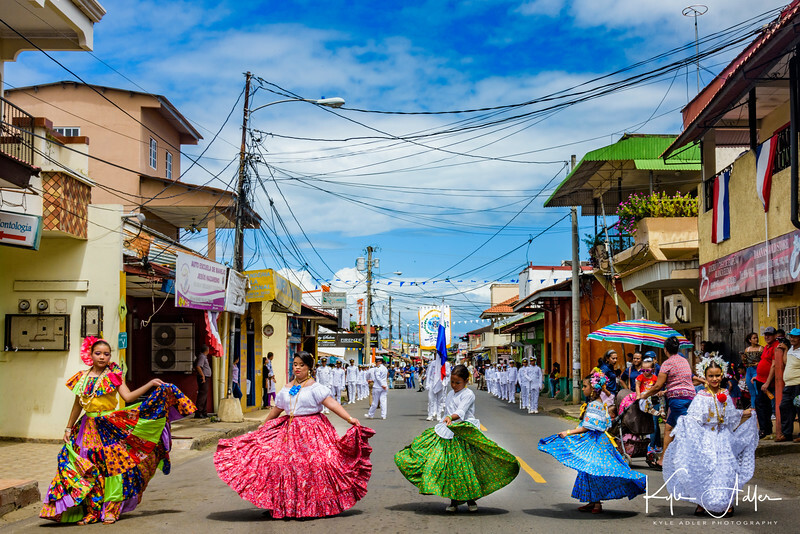 Departing Panama City for the historic and folkloric region of the Azuero Peninsula, we were very fortunate to arrive in the little town of Chitre on the day they celebrate Panama’s “First Cry of Independence”. The push for independence from Spain began here, then spread to the rest of the country. Whether halfway around the world or right in my home town, I’m always thrilled to have the chance to capture the special energy and tradition of a festival or celebration. The excitement is even greater when the festival, like this one, is off the tourist track and seen by very few people other than locals. In today’s post I share some favorite images from the first two days of this festival, along with some notes about how they were made. 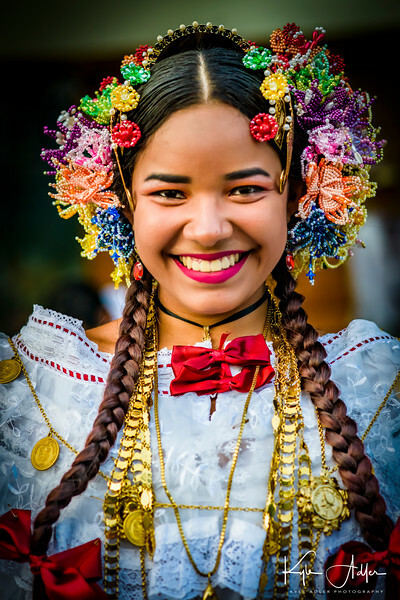 Click on any of the images to visit my Panama photo gallery, where you can browse and purchase many more images from this remarkable country. It’s a good idea to grab some “establishing shots” when photographing any festival or other large event. These images are made from a longer distance and/or with a wider lens than the close-up images that constitute the bulk of most portfolios. The establishing shots give a sense of scale so the viewer can understand the context for the other images. Here I used a slightly wide-angle lens to frame some of the parade participants against the lovely colonial church in the town’s main square. Because festivals are very busy events, it’s important to look for clean backgrounds insofar as possible. 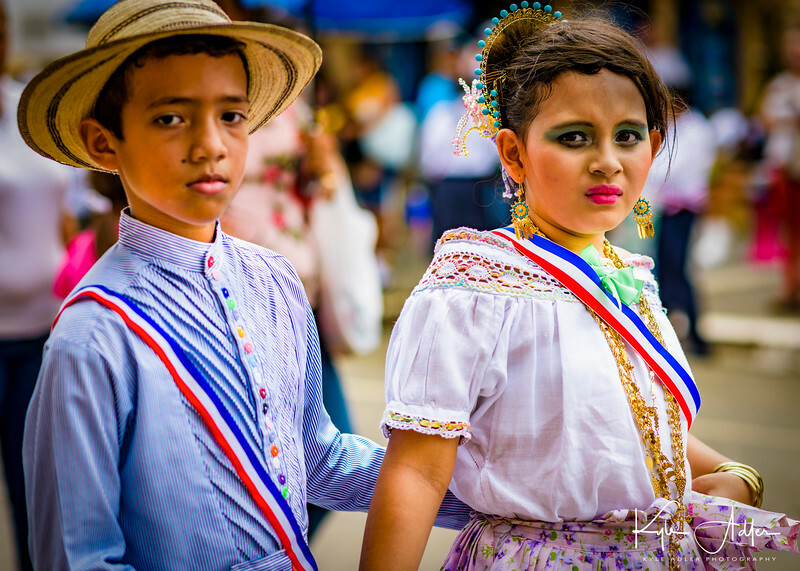 To make this portrait of two young Panamanians dressed in the national costume known as the pollera, I composed so as to minimize clutter in the background and also used a wide aperture (small f-stop number) to render the background in soft focus. Too often photographers compose based only on the main subject, but a clean background is at least as important to the success of the image than an interesting foreground subject. Not all portraits need to include the subject’s full face. I shot this colorfully attired marcher in profile so as to give a sense of color and motion, while revealing only one side of her face. 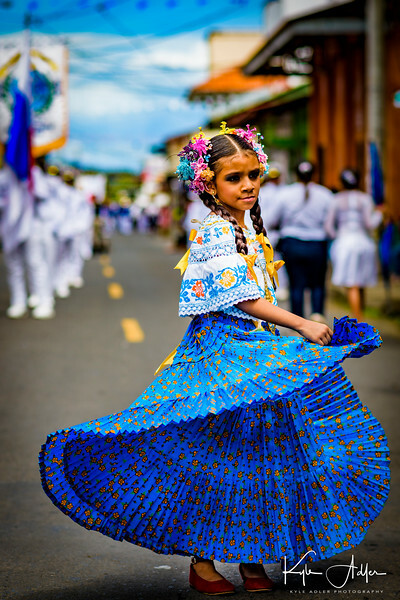 This young participant shows off her traditional Panamanian costume called a pollera. 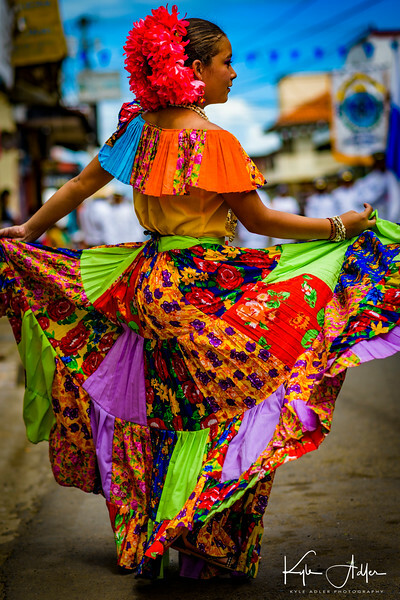 A wide aperture sets her off from the other participants in the background, while a fast shutter speed freezes the motion of her swirling pollera. In this image I captured the whole contingent of young women in their variously colored polleras. The lighting conditions were harsh, so I set the exposure manually be metering on the fabric of their costumes. In post-processing I had to adjust the highlights and shadows to ensure the subjects were evenly illuminated. 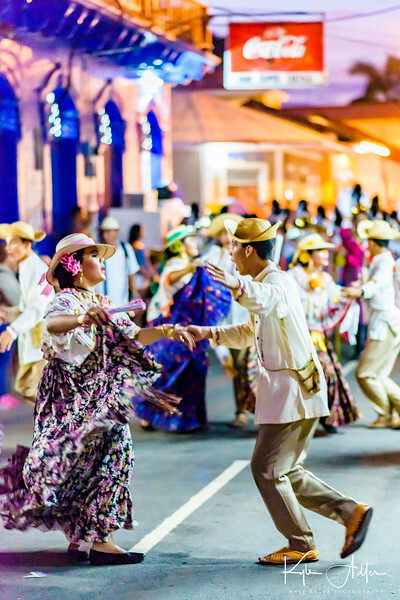 The second day of independence festivities are celebrated in the small town of Villa de los Santos. I asked this parade participant to pose for a portrait in a spot with a clean background and lovely soft lighting, then got in close with a fast prime portrait lens set to a wide aperture (small f-stop number) to throw the background out of focus. Soft lighting (which can be obtained by shooting near sunrise or sunset, or by moving the subject into a shaded area) makes vivid colors truly pop and flatters the subject of your portrait. 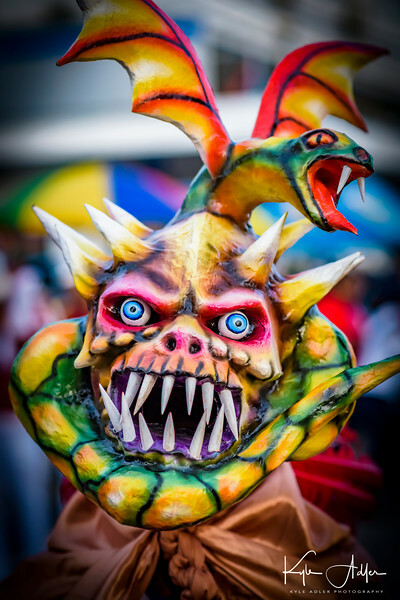 To make this portrait of a participant wearing a fanciful mask, I asked him to pose in a somewhat less cluttered spot, then made the image using a very shallow depth-of-field to emphasize the mask and throw the background into very soft focus. The “First Cry of Independence” festivities last well into the night. The extremely low-light conditions offer a photographer’s dilemma: either continue to shoot using only available light (and accept the added visual noise and motion blur) or switch to using flash (and live with its short coverage distance, artificial color cast, and distraction to the subjects). I chose to work with just available light, boosting my camera’s ISO sensitivity setting to as high as I could get away with and using a fast prime lens at a very wide aperture to gather as much light as possible, which in turn allowed the use of a reasonably fast shutter speed. 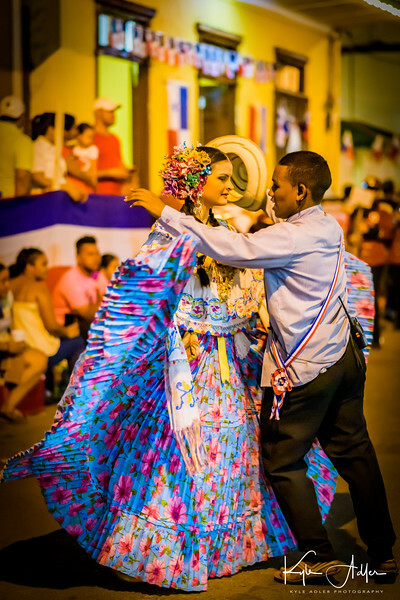 The results are lovely: sharp dancers in the foreground with just a touch of motion blur, soft focus on the dancers and buildings in the background, and a soft and painterly feel for the scene that to me feels quintessentially Panamanian. Sometimes it can be effective to embrace rather than avoid a cluttered background and to include it as part of the overall mood of the scene. That was my approach in making this image. I got in relatively close to the dancers in the foreground, using a moderate aperture setting to render the background crowds of spectators in soft focus, but still easy to discern. This gives the viewer a sense of being a part of the bigger celebration even while observing this intimate scene featuring the young couple. 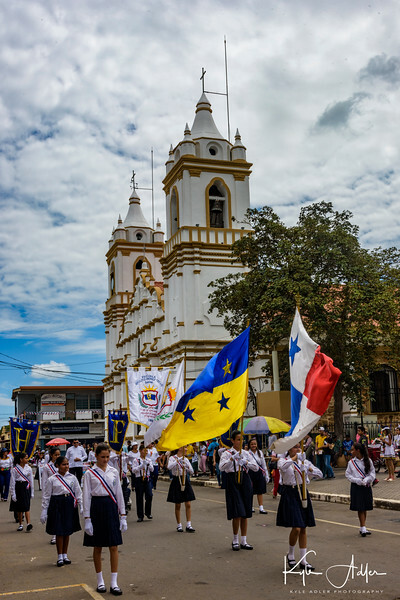 I hope you’ve enjoyed this photo essay on the first days of Panama’s independence celebrations. Have you experienced a little known local festival or celebration? Please share your experiences by leaving a comment here.